Dini Argeo s.r.l offers weighing solutions for hazardous environments classified by the ATEX 94/9/CE directives (IV attachment). From the design of the electronic boards to the production of indicators, load cells, platforms, pallet truck scales, and accessories, Dini Argeo srl offers a wide range of devices for ATEX zones. 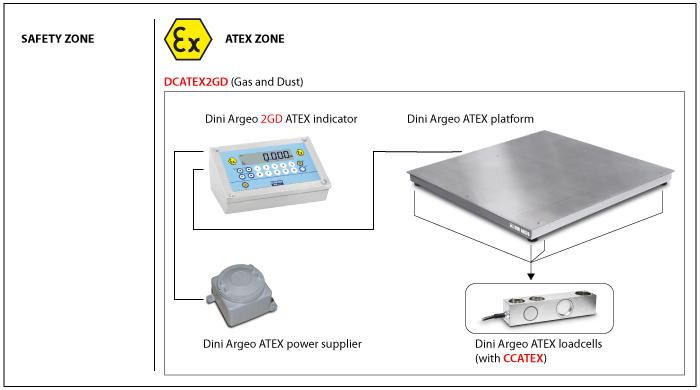 ATEX II 1GD Certificate for load cells of the Dini Argeo range. Ex II 2GD IIC T4 T197°C X DECLARATION OF ATEX CONFORMITY OF THE WHOLE SYSTEM, with relative LABEL OF THE WHOLE SYSTEM, for the ATEX Ex II 2GD weight indicator of the Dini Argeo range connected to the Dini Argeo mechanical structure with Dini Argeo ATEX load cells (each cell must have a CCATEX certification). Ex II 3GD IIC T6 T130°C X DECLARATION OF ATEX CONFORMITY OF THE WHOLE SYSTEM, with relative LABEL OF THE WHOLE SYSTEM, for the ATEX Ex II 3GD weight indicator of the Dini Argeo range connected to the Dini Argeo mechanical structure with Dini Argeo ATEX load cells (each cell must have a CCATEX certification). 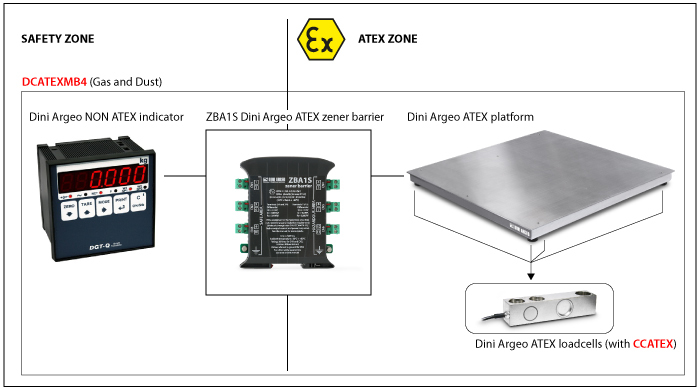 Ex II 3D T130°C X DECLARATION OF ATEX CONFORMITY OF THE WHOLE SYSTEM, with relative LABEL OF THE WHOLE SYSTEM, for the ATEX Ex II 3D weight indicator of the Dini Argeo range connected to the Dini Argeo mechanical structure with Dini Argeo ATEX load cells (each cell must have a CCATEX certification). Ex II 3GD IIC T6 T135°C X DECLARATION OF ATEX CONFORMITY OF THE WHOLE SYSTEM, with relative LABEL OF THE WHOLE SYSTEM, for the 3590EXT3GD Dini Argeo ATEX weight indicator connected to the Dini Argeo mechanical structure with Dini Argeo ATEX load cells (each cell must have a CCATEX certification). Ex II 2GD IIC T6 T125°C DECLARATION OF ATEX CONFORMITY OF THE WHOLE SYSTEM, with relative LABEL OF THE WHOLE SYSTEM, for a NON ATEX weight indicator connected to the MB4 Dini Argeo zener barriers, connected to the mechanical structure with ATEX load cells of the Dini Argeo range (each cell must have a CCATEX certification). 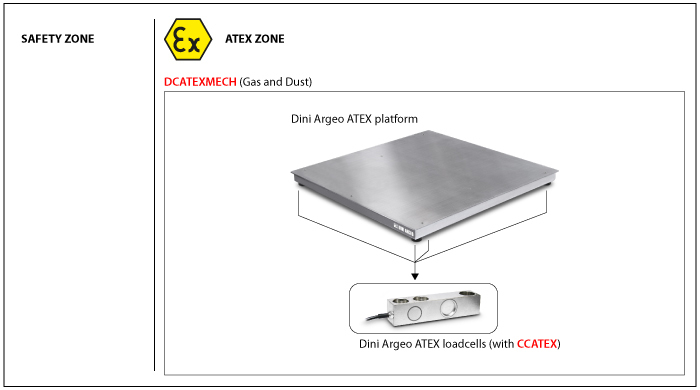 Ex II 2GD DECLARATION OF ATEX CONFORMITY OF THE WHOLE SYSTEM, with relative LABEL OF THE WHOLE SYSTEM, for a mechanical structure with ATEX load cells of the Dini Argeo range (each cell must have a CCATEX certification).